Overview: Hanukkah may be over this year, but there’s still time to kickstart this family-friendly board game about collecting candles for your menorah. Buy, sell, or auction candles, but watch out for the unlit ones! 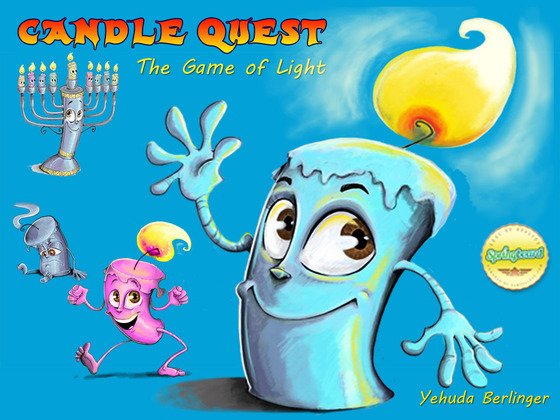 Candle Quest is a light strategy game that is year-round fun for any family, whether you celebrate Hanukkah or Christmas or Festivus. Rating: Excellent gameplay; components and art still in development. Who Will Like It? Families looking for a light strategy game that does involve some math and economic thinking but doesn’t get too complex — there are also optional rules for younger players to simplify the game, but my six-year-old liked the full rules with the auctions. Menorah board — collect 8 different candles to win. The goal of the game is to collect eight different candles for your menorah. That’s the original theme as designed by Yehuda Berlinger, though the game was then rethemed and published as It’s Alive! , a monster-building game in which you had to get eight different body parts. The return to candles makes it less gruesome and more appropriate for kids, though the gameplay is essentially the same. The theme and the mechanics don’t always match entirely — why can you either buy a candle or sell it to get money? — but it’s still a fun game. My review is based on a handmade prototype, so I can’t speak to the quality of the final components, but you can see the artwork by Darrell Mordecai which will be used in the final version. According to the Kickstarter page, the candles will be distinguished somewhat to make the game playable for color blind players — if you look closely, the wax drippings on the various candles is slightly different. I hope the changes will be more pronounced than that for it to be truly color blind–friendly, because it’s not simply based on the candle’s value. The menorah board is basically a board with eight squares, and the candles are square tiles. There will also be player screens so that others can’t see which candles you have already collected on your menorah. Each player takes a menorah board, a player screen, and 12 shekels. The remaining shekels are placed in a supply in the middle. The 60 candle tiles are shuffled and placed in a draw stack. Each player has a personal discard pile in front of their screen, but their shekels and candles they’ve collected are hidden by the screens. 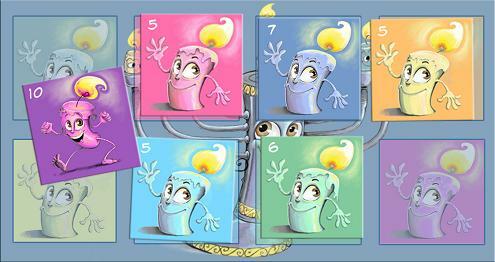 The goal of the game is to collect 8 different colored candles. The “dancing candle” is wild and can count for any color. 1. Turn over the top tile in the draw stack, or loot a discard pile. To loot a discard pile, you take the top candle from any discard pile and pay the bank the value of the candle in some combination of shekels and previously collected candles. Note: after paying this price to loot the discard pile, you still continue to step 2. 2. Buy, Sell, or Auction the candle. To buy a candle, you pay the value of the candle in shekels to the bank, and place the candle behind your player screen. To sell a candle, you put the candle in your discard pile and take half the value (rounded down) from the bank. To auction, you must bid at least 1 shekel for the candle. Each player in order gets one chance to bid or pass. Whoever bids the highest takes the candle. If you win the auction, your bid goes to the bank. If anyone else wins, their bid is paid to you. 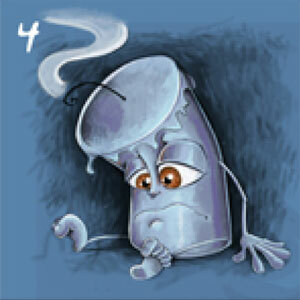 Candles you “spend” are placed in your discard pile, and the unlit candle goes behind your screen. 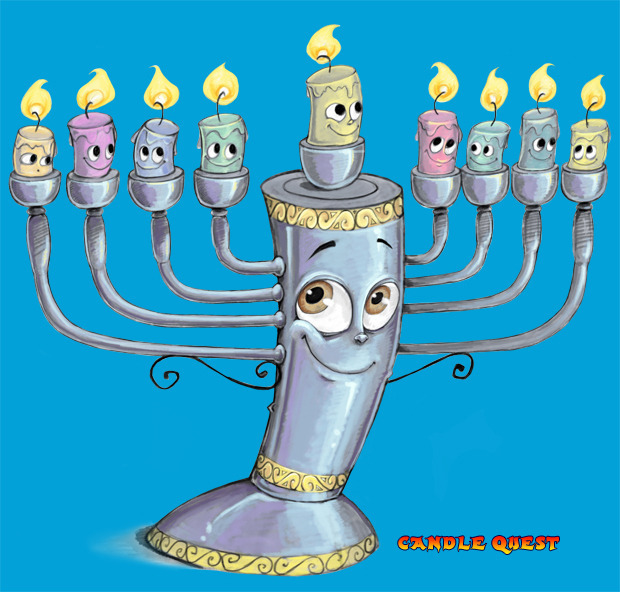 It doesn’t help your menorah, but you can use it later to guard other unlit candles or for paying to loot a discard pile. Any unlit candles that are spent to guard candles or loot discard piles are permanently removed from the game. After guarding your candles, you take an extra turn (but this time if it’s an unlit you draw something else and shuffle the unlit back into the deck). You can collect multiple candles of the same color, but they don’t count toward your 8 different colors — they just help you guard and loot. The game ends when one player fills their menorah board. The advanced rules involve point values for candles; when the game ends you total up value of your candles, and the player who finished their menorah gets five bonus points. You also add in points for your unspent shekels, up to half of your candle value. The simplified game drops the option to loot discard piles, as well as the auction mechanic, and you remove the 6-value unlit candles from the game. It adds another turn option: instead of taking a regular turn, you may discard an unlit candle to force another player to give you a colored candle of their choice. I hadn’t played It’s Alive! before, but I can see how the mechanics of this game could work with a number of different themes, and I’m suppose Reiver Games felt that a game about menorahs would attract a smaller crowd than one about monsters, where the dismembered body parts might turn some people off. While a game centered on Hanukkah may not grab everyone’s attention, the art and theme are definitely more approachable by a wider audience. The one thing that’s weird about the game thematically is the idea that you can take a candle and either buy it from the bank or sell it for half price to the bank. Whose candle is it, anyway? How does it work that you have to pay to take it, but somebody pays you if you don’t take it? And in what sort of auction do you pay somebody if you buy it yourself but everyone else pays you if they win? Of course, that may not bother most people. My kids understood the “buy/sell/auction” rules easily enough and never really questioned the reasoning behind it, and it does make for interesting choices. For instance, if you draw a candle you want, you can either just pay full value for it, or put it up for auction, hoping to get it for cheaper than full price. Or if you need money, an auction could bring in more than selling it to the bank. However, auctioning a candle also means you may be helping another player get closer to their eight candles, or you may end up paying for a candle you didn’t actually want if nobody outbids you. Candle Quest is fairly short, which means that you could play a couple of games in a row. With only two steps in a turn to explain, the game can be taught very quickly so there’s not a lot of downtime for your kids to get impatient, and the hidden player mats add that element of memory as you try to work out how much money everyone has before you put in a bid for a candle in an auction. I like the fact that Candle Quest is easy to teach and my kids enjoyed playing it. It gets them making decisions about how much things are worth, and considering whether they can get something they want for less than full price. The components quality remains to be seen, but the mechanics themselves are solid. Visit the Kickstarter page for more information, or click here for a copy of the rulebook. (The Kickstarter video isn’t great, but the rest of the page provides more information.) You can also visit the BoardGameGeek page for It’s Alive! — it’s not the same theme but is essentially the same game. Wired: Fun and family-friendly, without dismembered hands. Tired: Mechanics don’t make sense thematically. Disclosure: GeekDad received a prototype of this game for review purposes.